Irrespective of a person being a man or woman all of them like to have a look that can turn heads. Hairstyles are one such medium that can help in achieving this dream for an individual. People of all age-group want to have a hairstyle that suits not only their look but their age as well. Men especially tend to have short hair and don’t have many options when it comes to hairstyles and men who are over 50 have scarcity in this department. But there are actually various kinds of such options available for men over 50 which can be chosen by them. But getting the right kind of hairstyle is important because age is a matter for men who are above the age bar of 50. While experimenting with their hairstyle they keep their age in mind and then decide the overall look. Here are some great options for hairstyles for men over 50 that can be adorned by them with all ease and style. If you are among that group of men who is a stern believer of the fact that age is just a number then this particular hairstyle is perfect for your need. This funky hairstyle is short, fun and comfortable. It doesn’t give away the look of you being old or feeble but gives a cool look that you can carry with all ease and comfort. The colors variation which this particular look provides won’t make you look too young and out of proportion but will help in giving a balance as the browns and greys mixes up in a beautiful way. This is a perfect hairstyle for men over 50 who wants to look stylish but in a grey and pepper look. The hairstyle provides a wave with a back-comb that in turn defines the facial structure of the individual. It is a formal stylish look that can be a piece of art when carried well. The person over 50 who will be adorning this particular style is sure to get the feel of an old-wine-in-a-new-bottle feel with this look. This slick hairstyle gives away the look of a back-combed effect that gives an appealing look. This hairstyle is tailor-made for men who have receding hairline because of increase in age. If you have a problem of receding hairline then this particular hairstyle is perfect for the need. The sleek back-combed style gives away the effect of fullerenes in hair quality and texture. The volume look that it gives away is perfect and keeps your worries at bay in regards to thinning of hair. This messy medium look hairstyle is made for men who don’t want any tailored look when it comes to the styling of hair. This haircut will give the feel of messy hair that tends to bring down the age factor in looks for men over 50 years of age. The haircut is not short but has medium cut that can be given a look with some hair gel. Moreover, you can carry a small goatee style beard in your chin to provide for an overall makeover to your whole look. Men who want short and normal hairstyle for their elongated forehead can definitely opt for this particular hairstyle as it is made to give a smart look. 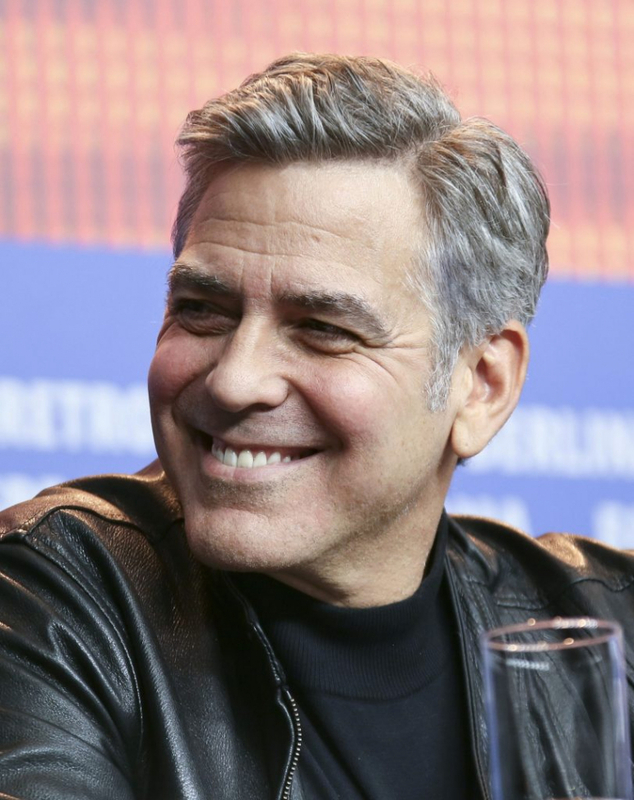 This is probably the simplest of looks available in hairstyle when it comes to men over 50. If you are somebody who doesn’t find ease in experimenting with hairstyles and want to go with the ones that are easy to carry and zero maintenance then this hairstyle is perfect for you. If you want a combination of young mixed up with old then this particular haircut is sure to sit as per your needs. The hairstyle is short and is spiked up on the top and is coupled up with grey color. If you already have grey hair then giving you this particular hairstyle is easy. The person adorning this spiky grey hair look can opt for going for a full beard that too in a grey tone so as to enhance the overall look of the hairstyle given to them. Side part hairstyle is a classic haircut among men of all age group and of all era. But this particular side part hairstyle is done based on the need of the present trend so that the person who is over the 50 years bar doesn’t feel out of place while showing off this look. The look is simple and classic and will set a balance to your age with just an addition of salt and pepper hair color. This hairstyle is a bit of side parting and spiky hair make up for an undeniably hot combination when it comes to providing this look to a man over 50. It can be termed as one of the best hairstyles for men over 50. The hairstyle has a side parting on one side that is not that clearly visible but otherwise, the spark gives flaring and different look to the overall haircut. With a further addition of grey and pepper hair color, one can be a head-turner on every occasion. This is look is like a fine wine that can make people drool over the look. 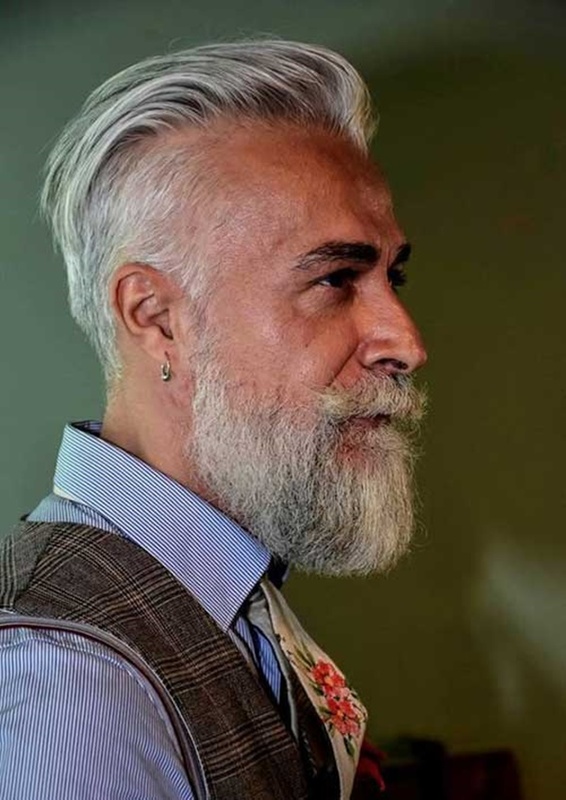 This slicked back grey haircut coupled with the beard is perfect for those men over 50 who want a variation to their overall look and want a hint of youth when it comes to hairstyle. This hairstyle is sophisticated, stylish and polished at the same time. If you are men over 50 years and have been suffering from the problem of receding hairline and are unable to choose a hairstyle that can cover this problem then here is a solution for you. The hairstyle is short and has spikes all over so that it can give away the look of volume in the hair. This probably the most useful and stylish hairstyle available for men who are over 50! Side comb hairstyle is a style that can never go out of fashion. If you are somebody who is well up the 50-year mark and want a hairstyle that is in fashion but doesn’t want to experiment with the hairstyle then this one is for you. This medium cut hairstyle has a side parting with a combed effect that is easy to carry and won’t look overboard as per your age. This hairstyle is not for those people who want classic hairstyles but for them who want experiment with their look even after crossing the bar of 50 years. The sides of the hair are cut short and the hairs in the middle are back-combed to give a look that stylish and trendy in all way possible. This stylish hairstyle has nothing indigenous but is still can be counted among the best hairstyles for men over 50 because of the overall look. A medium length hair is combed backward so as to give an effect that can be the best way to age with grace. Undercuts are in fashion these days when it comes to hairstyles. These hairstyles are the best way to make men over 50-year look gorgeous in every way possible. This hairstyle has variations thanks to the undercut and the volume in the top which makes it perfect. Men love messy hair irrespective of their age. This particular hairstyle is messy but comes with a full beard that gives the age a variation. The messy hair when connected with the beard look spell wonders for people who want a carefree look. This is a long hairstyle look for men over 50. The hairstyle is swept back to give the whole face a structure and the added ducktail beard is something that can be carried with ease and comfort by men when they are in their middle-ages. This is another ducktail beard combination with a messy hair that is perfect for men who want all the ingredients of a perfect hairstyle rolled into one. If you are somebody who vouches for classic yet stylish look then this haircut is in every way perfect for you. All these Hairstyles for Men Over 50 are custom-made for the need of a man. One can easily choose one from the above list and give a makeover to their hair irrespective of the fact they are gaining age.